… enter former CIA employee (in movies they always say "The CIA's like the mafia; you never leave" - but that's probably just movies) Bob Kiley. Kiley joined the CIA in 1963 after involvement in the anti-communist National Student Association. Bob came to the UK in January 2001 – within a couple weeks of George W. Bush taking office - to become chairman of London Regional Transport. He quit the job in 2005, but continues to enjoy his government-purchased £2 million Belgravia flat and a massive government paycheck for "consulting". In a recent newspaper interview, Bob clarified his job description. When asked exactly what he did to earn his continuing fees, he said: "Not much." Bob also admitted in the interview that he has is an alcoholic. But he insists that the disease hasn't affected his work – which is something we have heard from every alcoholic we have ever met. Kiley said he has gone to a few Alcoholics Anonymous meetings - a disclosure which would seem to indicate he doesn't know what the word "anonymous" means - but, as Bob well knows, there's a difference between just showing up at a place and actually doing the work that's required. 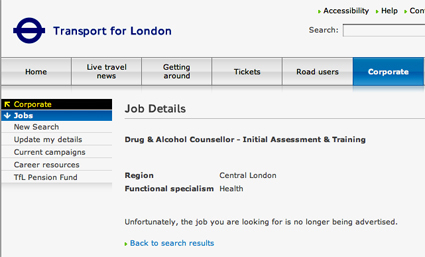 Coincidentally, we noticed a job posting at TFL a week or two ago requesting the services of a Drug & Alcohol Counsellor. The job is now no longer being advertised. We guess whoever got that job is making a fortune.